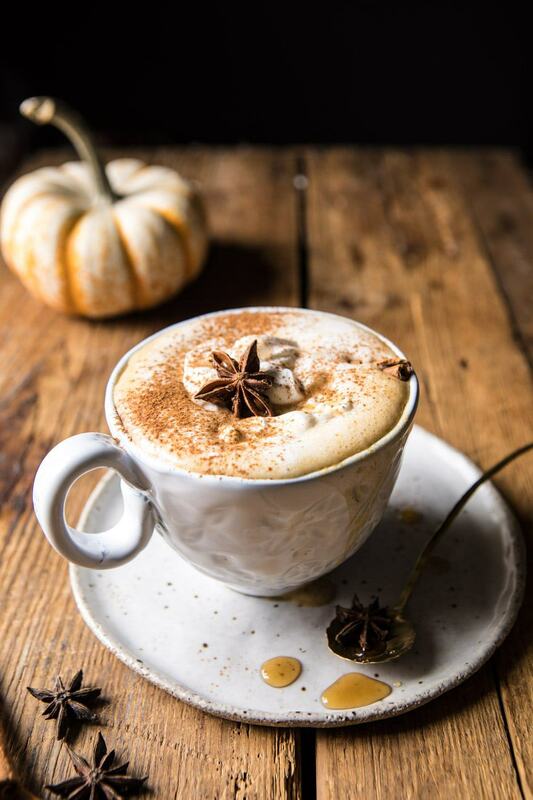 Spiced Pumpkin Maple Latte, or better yet…autumn in mug…with maple whipped cream. Made with just 4 simple, healthy, ingredients, all found in your pantry. This is the cozy, healthy version of your favorite fall latte. Trust me, no coffee house latte will beat out this homemade version. And the best part? You can make it yourself, in a mug, anytime you have a craving…and save money! Up until a couple of years ago I didn’t understand the world’s obsession with pumpkin spice lattes. If I was drinking something out of a mug, it was most definitely going to be homemade hot chocolate, and there was not going to be even an ounce of pumpkin involved. Times have clearly changed, as I am now fully embracing the pumpkin spice latte. 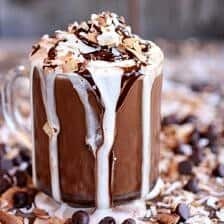 Don’t get me wrong, hot chocolate will always have my heart, and be the warm drink I turn to during the coldest of winter days. 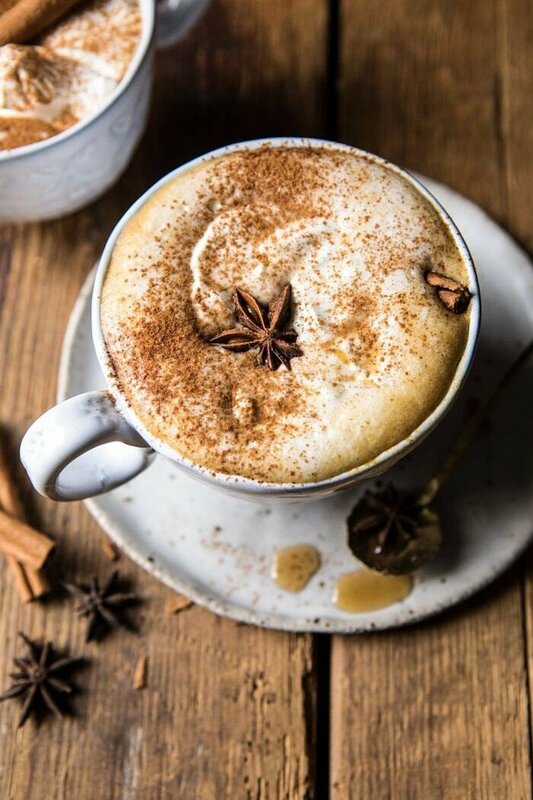 But October days are meant for pumpkin spice, and I’m satisfying those cravings with this super easy latte that takes just minutes to make. And OK. 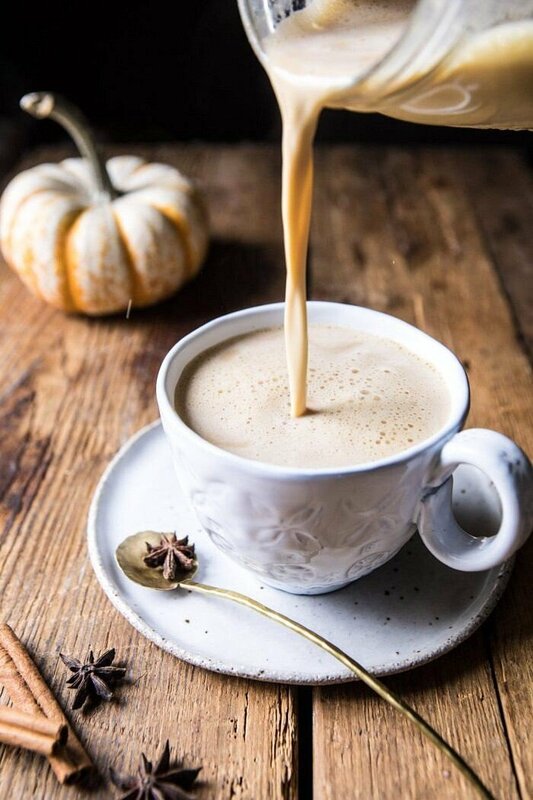 Yes, this latte is 100% the reason for developing this spiced pumpkin butter from last week. Let me explain. A few weeks back I was brainstorming fall recipes. For whatever reason a pumpkin butter latte came to mind. Sometimes recipe names will come into my head before I’ve even developed any kind of recipe. Whenever I have a good name for a recipe, I know it’s one I need to make. If it doesn’t sound good from the start, I’ll never make it. Basically, my recipe titles are very important to me. If it sounds boring, it is boring, and I don’t make it. A spiced pumpkin butter maple latte sounded delicious. 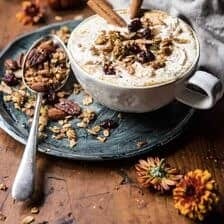 And just a little different from the typical pumpkin spice latte, so I was excited to create this recipe. Plus, I figured this latte recipe would be the perfect excuse to finally make homemade pumpkin butter. Which I’ve been wanting to make for years now. With just 4 ingredients, this latte is the easiest thing you’ll make all week long. 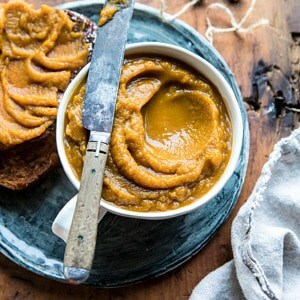 To start, make a batch of my spiced pumpkin butter. It too is easy, and will take only twenty minutes or so to make. One batch will last you a good amount of time. So once it’s made, you’ll have it on hand for whenever the craving for a pumpkin latte hits. Of course, if you’re not into making the pumpkin butter yourself, yes, you can use store bought pumpkin butter. Just be sure to find a good brand. I love Trader Joe’s pumpkin butter, as well as Whole Foods. This pecan pumpkin butter from Williams-Sonoma is extra delicious too. Alright, now that you have your pumpkin butter, it’s time to make the best homemade latte. Mix up your favorite milk (goat milk is my usual go-to, but coconut milk is another favorite for lattes). Add a little pumpkin butter, and heat until warm and steamy. Now add coffee to your favorite mug (find a good mug, the cuter the better, because yes, the mug makes a difference…you need a latte mug). 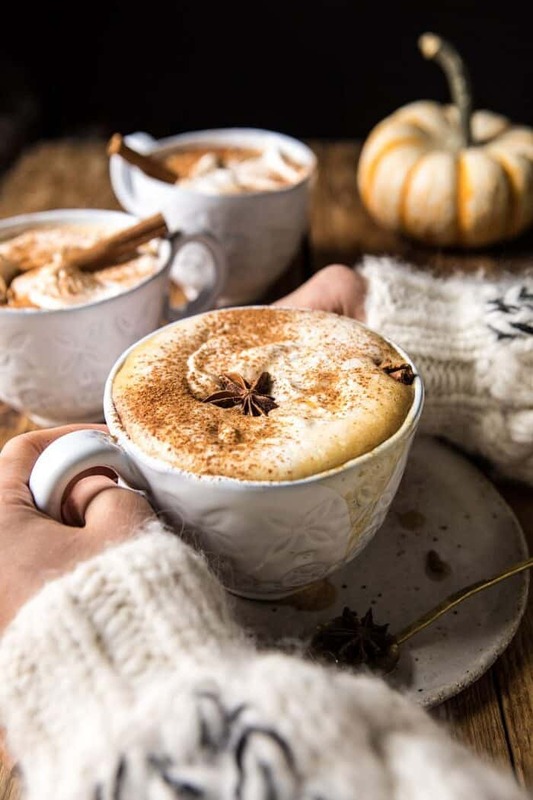 Pour the spiced pumpkin milk over the coffee, add maple whipped cream, a dusting of cinnamon, and say hello to the most perfect autumn latte that there ever was. I know, I am so dramatic, but my love for this latte is real, and I can’t help but be excited about it! What’s great about this latte is that while it feels indulgent, it not loaded with sugar and a million other things that most coffee shops use. So you don’t have to feel an ounce of guilt while sipping this. Bonus? 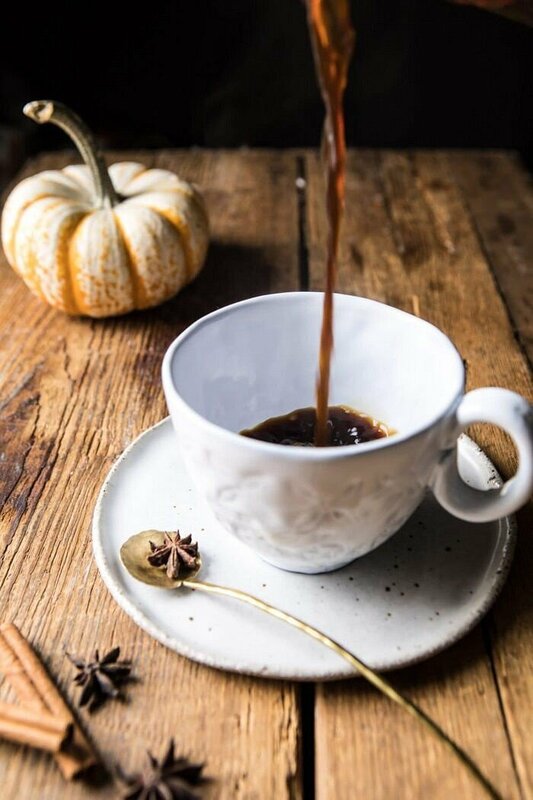 You’ll save a ton of money by fueling your pumpkin spice addiction with this homemade version instead. Meaning more money to spend on your loved ones (or yourself) this holiday season. Cool. Cool. Loving it. PS. this makes the best Tuesday afternoon pick me up when your energy is running low. You must try it. 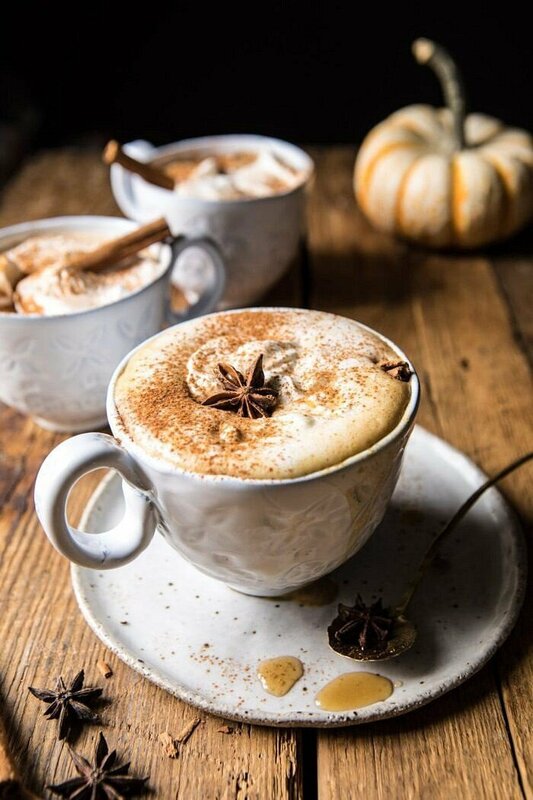 If you make this spiced pumpkin maple latte please be sure to leave a comment and/or give this recipe a rating! Above all, I love to hear from you guys and always do my best to respond to each and every comment. And of course, if you do make this recipe, don’t forget to also tag me on Instagram! Looking through the photos of recipes you all have made is my favorite! Autumn in mug...made with just 4 simple, healthy, ingredients, all found in your pantry! 1. Combine the milk, pumpkin butter, and vanilla in a medium pot and bring to a simmer, heating the mixture until it is steaming. When the mixture is steaming hot, remove it from the heat. Using a small whisk or a fork, whisk until frothy. 2. Pour the hot coffee between 2 mugs and then pour over the frothed pumpkin milk. Top with whipped cream and a sprinkle of cinnamon...or cinnamon sugar. 1. Using an electric mixer, whip the cream until soft peaks form. Add the maple syrup and whip once more until combined and fluffy. 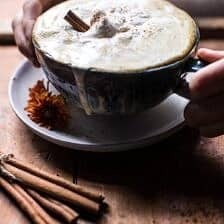 how do you make the foam on top can you please give a detailed post on how to make and resent lattes? Thank you! This is so sweet! Looks delicious! Is the coconut milk canned or refrigerated? 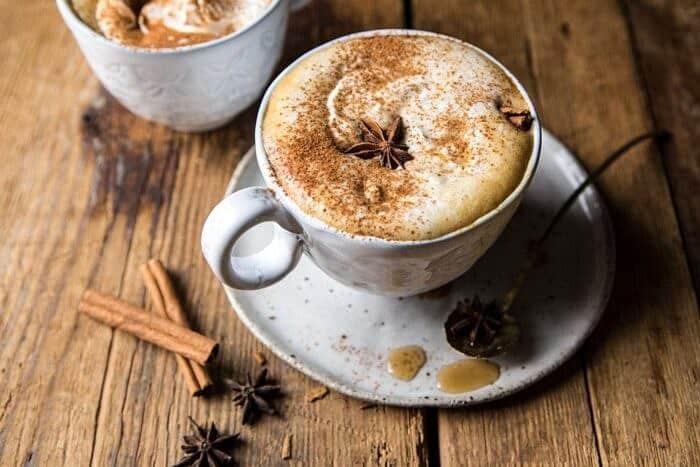 Wowza – I’m a Latte woman through and through and I need to try this!! YES! I hope you love this Rebecca! These photos/food styling are gorgeous, Tieghan! And the pecan pumpkin butter from Williams Sonoma is always a fall favorite of mine. It’s on the sweet side but is really good mixed into baked goods and squash recipes. That latte looks and sounds amazing! If only the coffee places would catch on and make lattes more wholesome! Not to be a complete curmudgeon but are you honestly recommending a $60 mug as a must have? Yes, it is lovely, but – goodness – they offer a payment plan for it! I am so glad you like this latte, Taylor! Thank you! In general, I’m definitely NOT a coffee person. However, add in some Stevia and almond milk in a decaf coffee cup, and I will literally drink ten cups of that coffee combination. I can imagine what pumpkin spice will do for my favorite coffee. I would probably drink wayyyyy too much of them, LOL! haha yes I am obsessed with them! I hope you try this Cassie! Made this latte recipe this morning right after seeing this post, and it was SO GOOD! Thank you for the great recipe Tieghan! I am so happy you loved this! Thank you Johanna! This looks delicious! Is the coconut milk canned or refrigerated? Omg this sounds INCREDIBLE and so autumnal! Once the temperature drops here in DC I’ll def be making this. So perfect! I hope you love this Katie! 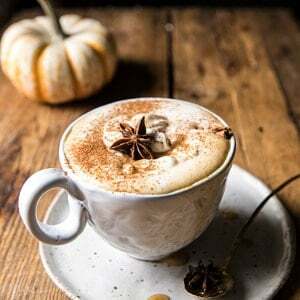 Hi, I’m over in New Zealand and would just love to try this but I can’t find pumpkin spice mix anywhere (to make the butter) 😥 do you have any suggestions how I could make my own pumpkin spice mix? Thanks! BTW, keep up these amazing posts … You’re an unbelieveable inspiration with how much you amange to get into each day! OMG!!! I had three today!!! … is that a bad thing? NOT AT ALL! I am so glad you loved this Karen! Thank you! I love this!! I took my coffee up a notch! This morning I had alfalfa from the ranch chores, and this afternoon I am enjoying this!! Maple and pumpkin for the win!!! I am so glad you enjoyed this Katie! Thank you! Such a perfect fall latte! I hope you try this! Thank you Laura! Made this with coffee for my husband. So glad I found this. I am so glad he enjoyed it! Thank you Ann! This is seriously good! Never thought of using pumpkin butter in my coffee…. mind blown! I am so glad you like this! Thank you Stephanie! Its look very beautiful. Thanks for such of this recipe. Waiting for more interesting recipes like this. Thank you so much Erika! I am so glad you loved this recipe and I hope you love it more with more maple! Thank you!